Unlike on the ancient telephone, dialing a number on your Samsung Galaxy Note 3 isn’t an interactive process: You type the number and then touch the green Phone icon to dial. The number is spewed into the phone system like water from a fire hose. When you need to pause the number as it’s dialed, you must know the secret. When you need to insert a pause, press the Menu button. Up pops a menu with two options for inserting pauses into a number. Here is how those options appear when chosen. 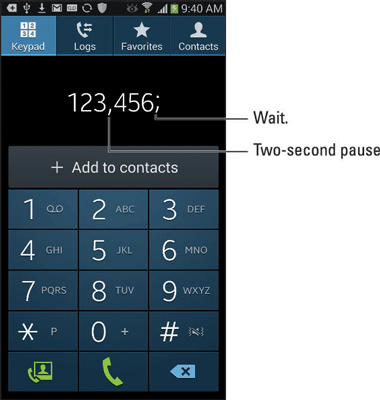 Choose Add 2-Sec Pause to insert a 2-second pause, or choose Add Wait to create a prompt into the phone number that’s dialed. The Add 2-Sec Pause command inserts the comma (,) character into the number. When the phone dials the comma, it waits for two seconds and then dials the rest of the number. The Add Wait command inserts the semicolon (;) character into the number. When the phone dials the semicolon, an onscreen prompt is displayed. When you’re done, dial the number. When the comma character is encountered, the phone pauses two seconds and then dials the rest of the number. When the semicolon character is encountered, the phone prompts you to continue. Touch the OK button to dial the rest of the number. The , and ; characters can also be inserted into phone numbers assigned to your contact.